I have a new video for you guys! I have re-vamped for you what is going to be a total regular in your fall rotation, because it is literally the easiest, fastest dinner EVER. Like legit 15 minutes to your meal. But my comfort food cravings are already here. It’s like how sometimes you will force wearing sweaters and boots and stuff when it is not really cold enough for it, just because you really are ready for Fall fashion? And then really you just walk around all sweaty and uncomfortable all day? Well, I am kind of doing that with Fall comfort food. But when you see how good this is, maybe you won’t even blame me. This is the coolest thing ever. 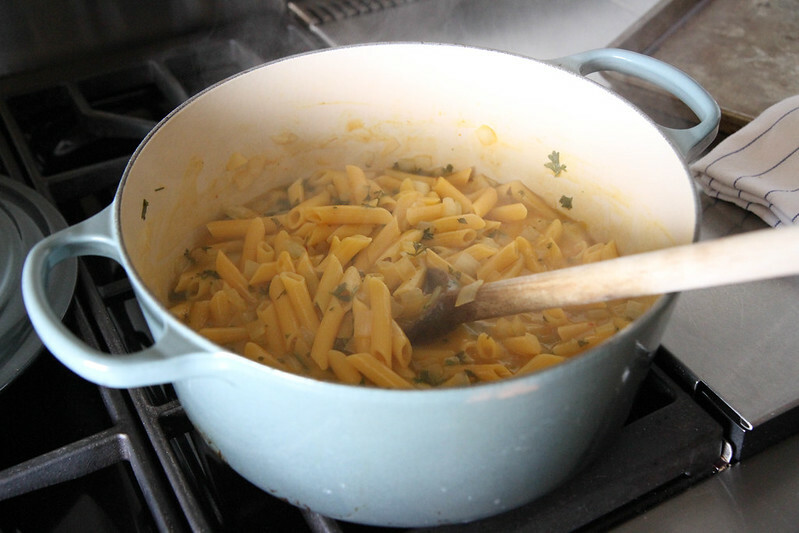 I have been obsessed with the one pot pasta dishes ever since Martha Stewart put this out into the universe. There have been some really cool versions of this over the last year or so, and one of them I saw on Pinterest and I knew I had to make something like this. So I revamped it into a dairy, gluten and egg free version, and the result was AMAZING!!! First of all, the creamy pumpkin sauce totally mimics cheese. My kids and my God daughter Ellie actually thought maybe it was cheese, and they totally gobbled down huge bowls of it. And I have to admit- as much as I loved it (I ate a solid half pound of pasta) I was surprised that they did! But as we all know, you should never question that type of thing and I just served them up some more and smiled nicely. But at the end I was supremely pleased with myself. In a large heavy pot combine all of the ingredients except for the coconut cream. Put a lid on the pot and turn the heat onto medium. Cook for 10 minutes. Take the lid off and turn the heat off. Stir until creamy and then season to taste with kosher salt. Serve hot. This looks delicious! It certainly was gorgeous this weekend in Seattle! Such a big pot of deliciousness. LOVE this! Nice pumpkin pasta! I like the use of the coconut cream! 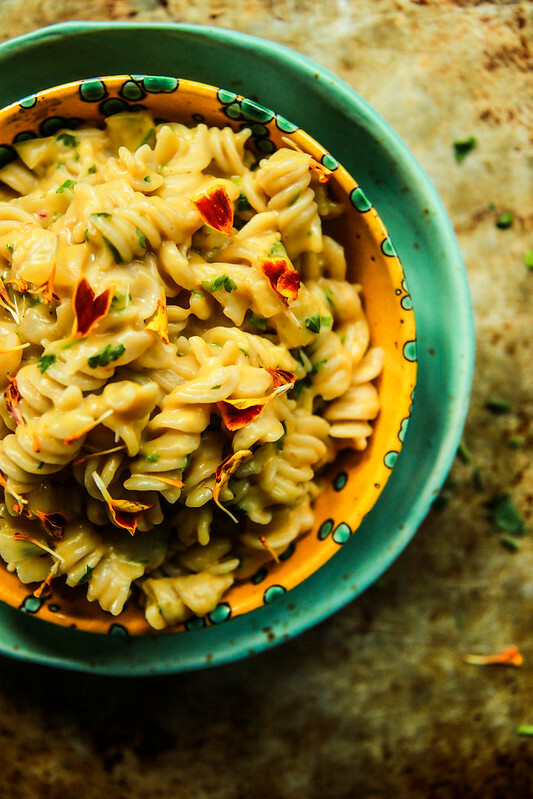 What a gorgeous Fall pasta! So trying this for dinner!! Oh good Jenny! hope you like it! Love that you used coconut cream in the this!! Thanks Marla! It keeps it vegan and creamy! What a cool idea! Never thought to cook pasta that way. Thanks for that. Enjoy the nice warm weather while it lasts. Here in the northeast it’s been a bit cool. Oh good Kelley! Then at least maybe this isn’t too Autumnal for you 🙂 And yes- I am going to start cooking pasta like this ALL the time! One pot everything!!! This looks amazing, I love that it’s also dairy free. Thank you Naomi- I know- it really tastes like it is rich with cream and cheese- so we are so excited to have an indulgent treat like this that we can eat! Such a great weeknight meal, Heather. Pinned! Thanks Aimee! Yes- you rally can’t beat a 10 minute meal! Oh wow, I love how creamy this is!!! It seemed like great weather on your side and my side this weekend! I am going to try this as my first cross-over attempt to see if my toddler will go beyond red sauce! I’ve been craving creamy pumpkin pasta but since I’m avoiding dairy right now (for my nursing son’s eczema) I didn’t think I’d get it. Thank you so much for this recipe! Yes!!! That makes me so happy Cait!- you won’t even miss the dairy here! I am so excited about this recipe Heather! Pinning now!! Can you find canned unsweetened coconut cream/milk at “regular” grocery stores? I’ve never used it before, so want to know if I can go to a regular safeway/giant or if i should go to whole foods. Hoping to try this recipe tonight!! Coconut milk is everywhere- just look in the Asian section at Safeway. But do not shake the can- you want the head solids that connect on the lid. Coconut Cream is at Trader Joes- but I have had no luck finding that at a more mainstream grocery store. Oh good! 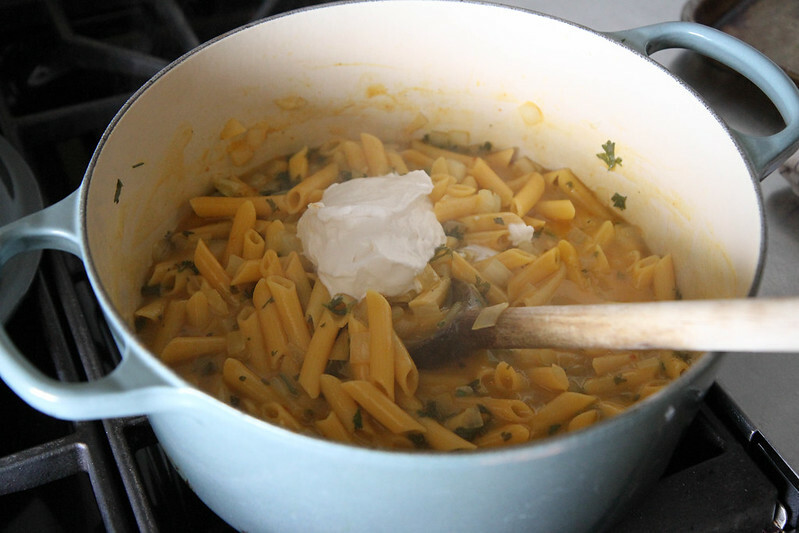 I’m so excited – I’m trying dairy-free for a few weeks and this recipe will be a godsend. Thanks, Heather! Kate, if you get a chance, please let me know how you feel going dairy free !! Hi Heather – so far dairy-free has not been too challenging…and this is coming from a cheese-loving Italian girl! I’m at about 2.5 weeks now – no major differences yet, but I do feel “lighter”. For example, I don’t feel as full after meals as I used to – I feel satisfied, but just not bloated and full. And I feel a little more trim, although that could just be my mind playing tricks on me 🙂 We’ll see what happens – I’m holding out for another week and a half to make it a full 4 weeks! ….and I’m making this tonight – can’t wait!! My local Trader Joe’s did not have coconut cream but I did find it at Whole Foods Market. Oh great Michelle! So glad you found it! 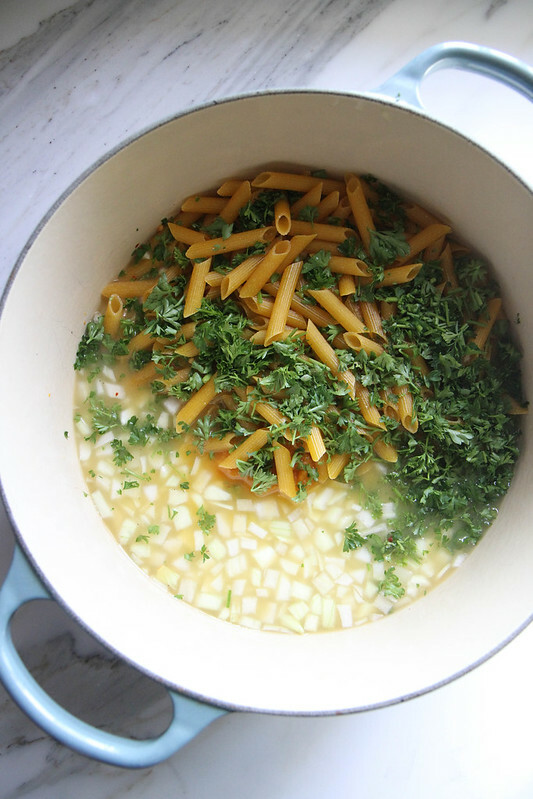 Gorgeous, this is one pot pasta perfection! Just served this fabulous pasta for dinner while watching the SF Giants playoff game. It was delicious and a big hit. Thanks, Heather! I have Martha’s “One Pot” book and will try her version, as well. You were terrific on Cutthroat Kitchen!!! As a former Laurelhurst girl, I really look forward to reading your each and every blog and the little notes about Seattle. Keep up the great work you do and wonderful photography. Thank you so much Julie, that makes me so happy!!! What kind of white wine works best? Dry white wine is my preference ! I think I used a Sauvignon Blanc, but just use whatever you have open! gosh i seem to be having you in my kitchen alot lately!! its great! making this for tonite and cant wait to smell it, feast my eyes on it and EAT IT!!! youve got a heavenly mix of all things fall and wonderful. i think i will call it a “one pot wonderfall”!! Looks delicious. I’m loving all the pumpkin dishes this year. Thank you Kathy! I always have to pumpkin overload at this time of year when it is in season! it’s just so versatile!! This looks yummy! Trying it out tonight. I wonder if the recipe for the greek stuffed peppers you made on cutthroat kitchen will possibly be added sometime soon? OMG this looks AMAZING Heather!! Definitely on my to-do list! 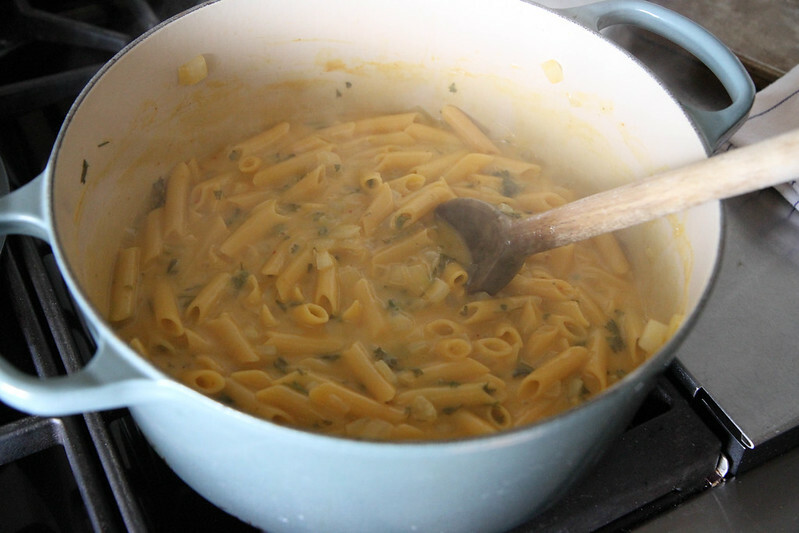 I still haven’t tried making 1 pot pasta! I’m really excited to try this one 🙂 Can one substitute other types of squash for pumpkin puree? Did you use fresh pumpkin or is canned ok? I know fresh is always better…also I can’t have onions usually I add in leeks, but if I leave them out do you think it’d still taste good? 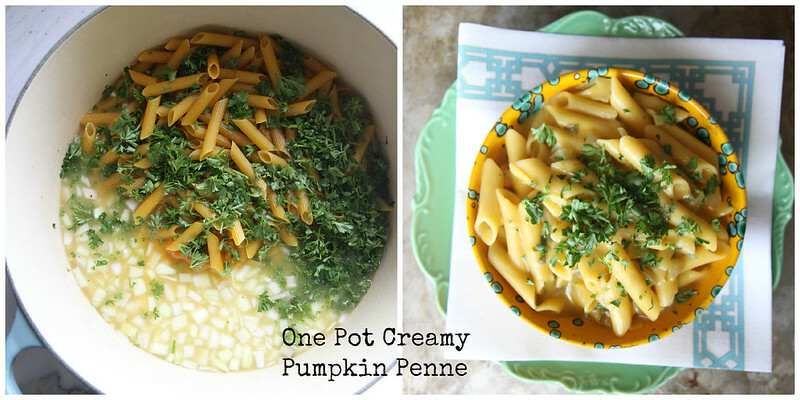 Would it be possible for you to email me this recipe (One Pot Creamy Pumpkin Penne)? There was no option to send via e-mail. Thank you! This looks amazingly good. I’ve been browsing around for pumpkin pasta recipe which excludes cheese (just because I don’t always have it in the fridge). Is it possible to sub the coconut cream with thick unsweetened yogurt? Thanks! I made this last night expecting a decent meal, and instead I got a meal of epic deliciousness. I cannot wait to have leftovers for lunch today. Thank you so much!!!!! What would you recommend as a replacement for the white wine? Hi Heather! This recipe looks delicious and I am very excited to try it. I am allergic so am wondering if you have a suggestion for something to replace the coconut cream aside from heavy cream. Let me know your thoughts! Hi Leah- GOOOOOOD question. Are you allergic to nuts? If not, I would recommend a homemade nut milk. You could use a store bought almond or cashew milk, but with a homemade one you could create a much thicker version. I’m not sure what your allergies are, but you could also consider Greek yogurt or Goat yogurt or goat cheese? You could also stir in a knob of vegan butter (with or without soy). If none of that stuff is good for you, I would just say that you don’t need any of it. It’s great without it! Thank you so much for the suggestions! I am allergic to all nuts so it sounds like a greek yogurt might work bests! Would you recommend the 1/2 cup of greek yogurt or a different amount? Yes- i would keep the 1/2 cup measurement! Looks fabulous! What GF pasta do you prefer? Hi Leslie- I have recently been using a brown rice-quinoa blend (they have it at Trader Joes and Met Market has a great selection!) I like a little something besides just rice pasta, because it holds up better! Just made this and put basil and sage in it. SO GOOD! Definitely gonna make this a lot more this season! Can’t get over how creamy it is and reminiscent of cheese haha. Oh awesome Molly!! so happy that you liked it!! This looks so yummy and comforting! Yay for pumpkin season! I JUST made this for dinner! I hadn’t had it since last winter and was totally craving some pumpkin done right. LOVE THIS. Heather, I have a suggestion for you. I often copy and paste your recipes into a word document and then save it into my files. Every time I do that I always put your name under recipe title so I remember where I got the recipe. I would suggest you put your web address under the title of the recipe and before the ingredients list so that you will always get credit for your creations. Tonights dinner. Thank you. I might try adding prosciutto and sage. Any chance you can have a search option for instant pot and or slow cooker recipes? There are nights like tonight when I’m driving in circles getting kids to their activities. So I need a meal I can put in the instant pot and not worry about the stove on when I’m gone. And I’ll have a meal ready for the various kids who are coming and going at different times. Been loving trying your recipes. This looks great, what GF pasta did you use? I just used the brown rice- quinoa blend from Trader Joes! In the instructions they mention not to add the coconut cream till after everything is cooked but in the video they show you adding the cream in the beginning. I noticed the same thing. I wonder which way is best. Is it 1 pound of dry pasta with 4 cups of broth? Seems like not enough water for over a box full of pasta. Can’t wait to make it, just want to make sure I don’t mess up. Yes! That is the ration and it turns out perfectly! 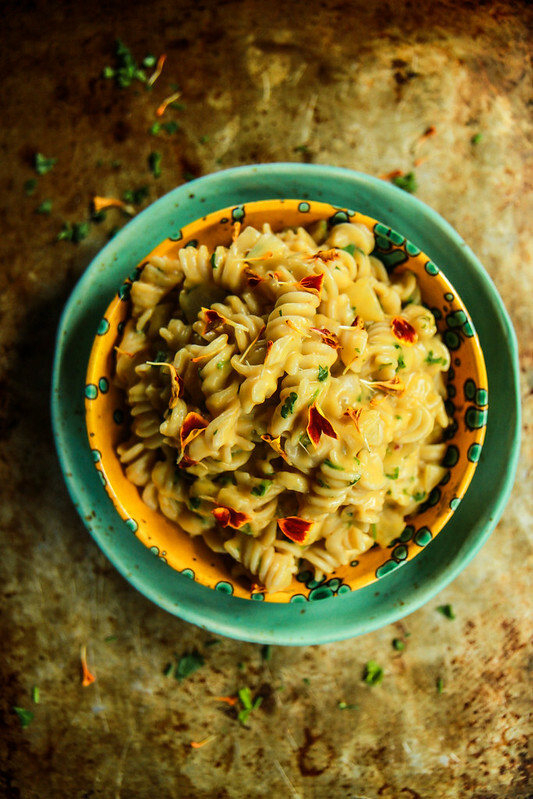 The Creamy Pumpkin Pasta looks luscious and heartwarming! I would love to try this over the weekend. It’s getting cold these days and this might just be our go-to-meal when we’d want something to fill us up and warm our bodies. I can imagine it would go well with either garlic bread or grilled/pan-seared chicken. Thank you for sharing this mouth-watering recipe, Heather! I don’t usually write reviews. 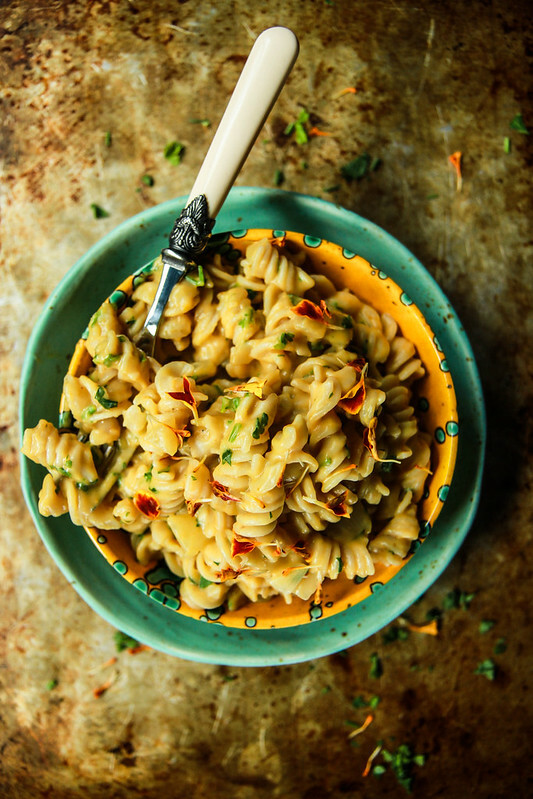 This pasta is so easy to make and so creamy and delicious. Heather, you rock! Thanks for sharing your wonderful recipes!! Yay!! THank you so much Jen! My oh my!!! This pasta dish is a beaut! Can’t wait to try this on Thanksgiving week this year!